When you can arrive in a limo, why walk 250 yards, right? I don’t know if Donald Trump goes for walks. I know he likes golf carts and exclamation points and red ties and Moscow, but I don’t know if he likes walking. I don’t seem him as a walker. I don’t see him enjoying time minus his phone. Not that photos of a President sitting in a stretch limo imply he can’t or doesn’t enjoy walking, but it seems silly to opt out of stretching your legs for 0.2 miles. Donald and Melania Trump visited George and Laura Bush at Blair House, the guest quarters across the road from the White House where bigwigs are put up, and where the Bush family was staying (privileges of being a former US Prez). But that’s what the first couple did: to condole the passing of George H.W. Bush, the 41st former Prez, they took a really short ride in a really long car. That was a nice gesture though. But it got kind of drowned in the bass of the eight cars in Trump’s motorcade that pulled up in no time at Blair House. But again, none of that means Trump doesn’t like walking. Which is fine, I guess, even for a man who could drop a few kilos and benefit from healthier blood pressure. I know he doesn’t like or believe in climate change so maybe none of the people who handle him bothered to tap his shoulder: “Mr President, this trip is going to result in a carbon footprint of such and such number. Perhaps it’s advisable that instead of —”. Surely Trump wouldn’t have interrupted these daring green warriors and blurted, “Just get the damn car, and grab Mel, will ya?” He wouldn’t have said that. But why didn’t he simply walk? On Twitter user commented under the tweet by White House reporter Jennifer Jacobs (@JenniferJJacobs), “If it’s a ‘pride of lions’, then what the hell is this? An ‘overcompensation of SUVs’? It was an expensive ride too. Another commenter guessed that the ride probably cost the American public $25,000. I don’t know the protocol of these things. But who would really mind if a President strode up from across the road? Apparently from the West Wing, it’s a 5-minute walk. But maybe Trump didn’t want to listen to protestors outside the White House saying mean things. I was a tourist there once, Obama time, and I was intrigued to see the vast lawns. I’d have liked to walk on those lawns, preferably barefoot. But Trump is not similarly constrained. Nobody would pounce on him for walking on the grass, were he to decide on a detour. But then, he doesn’t have to be gamboling on those lawns on the day of a condolence visit that lasted 20 minutes. That would be poor form too. My other assumption was that Melania didn’t want to walk in heels. But a minion could have carried her fancy-pants heels in a tote for her to switch to after she made the short walk in comfy pumps or something. 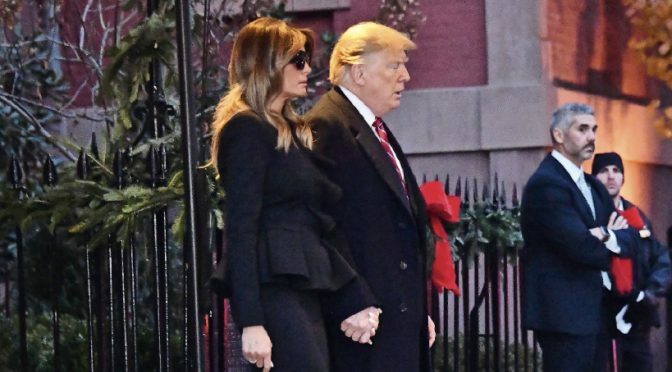 Maybe Trump had shoe bite in those black formal shoes he was wearing with his overcoat (it wasn’t raining). Someone joked about a bone spur. Maybe he could have worn sneakers. That would have been a much less awkward sight than seeing the frostiness in the front row later at the funeral once the Trumps arrived and took their seats beside three former Democrat Presidents. The Obamas and Clintons were happily chatting before the Trumps arrived. If he had worn sneakers, his shoe-line owning pal, Kanye West, (now known only as ‘ye’), would have high-fived him on Twitter and sent him a free pair of Yeezys. So maybe that’s what was going on with the stretch limo and the unwillingness to hit it on foot for those 250 yards? Another wise guy comment online rubbished most theories of why Trump didn’t just walk those 250 yards. He said the real reason was his hair. A light breeze might have caused the orange wig to fly and the squirrel that lives in it would get wet if it rained. Hey, if I were a wig-wearing Prez, I’d be worried too. The optics have to be not embarrassing. I still think he could have swung it with sneakers and a trapper hat. Then instead of conjecture about how unfit a President he is, in every way, we could have concentrated on Trump the fashion icon.